"Where do you go, life after tragedy?" 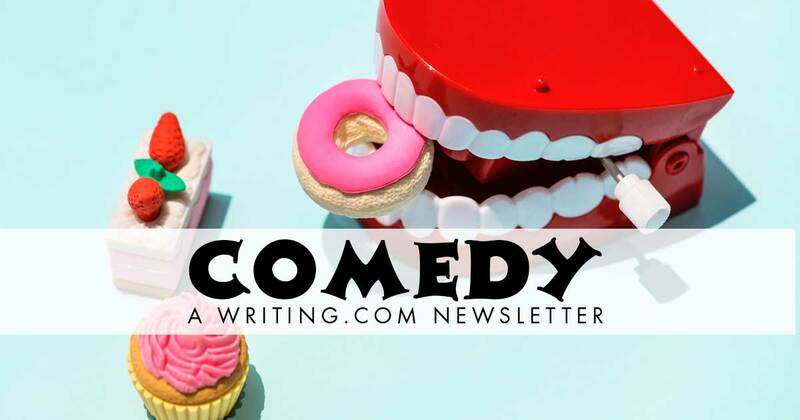 I am honored to be your guest host for this week’s edition of the Comedy Newsletter. If we look, we can find humor in most anything. As writers, we strive to expose and adroitly express that humor in prose and/or poetry. Humor is healing, rejuvenating, and provides a welcome respite from tension. Okay, cliché time ~ “Laughter is good medicine!.” It’s being tested (and perhaps proven) daily in worker productivity, social altruism, and family harmony (or lack of overt hostility). Medical science is even jumping in with scientific studies postulating that humor is good preventive medicine; with studies which apparently show laughter releases beneficent endorphins into the bloodstream. The act of laughing has even been touted as an easy, age retarding, low impact physical exercise, requiring merely seven muscles to raise a smile , as opposed to twenty-some for a line-scoring, drooping frown . "Funny is in the eye of the beholder" Humor is out there, seeking but the discerning eye and open mind (which writers, by nature, must have). Comedy today has quite a variety of forms for expression, from slapstick and physical comedy to the sardonic and wry wit of political jokes. Just think about it, who wouldn’t laugh as the convenience store robber, running for the exit, holding tight his bag of cash from the register, finds his unbelted ‘fashionable’ droopy drawers falling to his ankles. He has to stop and bend over to pull them up, an apparent invitation to the arriving cops to cuff his wrists and retrieve the money, his pants effectively still shackling his ankles. Here, a potential crime becomes a comedic repast. As you see, humor can be subtle or satiric, as well as out-and-out funny, like the joking miming clown (physical) or stand-up comedian telling jokes. To be effective (and get a laugh or smile), what they all require is a sense of pacing - a writer who can see the humor in something others may overlook or bypass as white noise, and build up to it by expectation or with a twist. If you google or bing or otherwise search-engine the word 'cliche' you will be surprised at some of the examples - from common speech to inspirational to solemn to silly. Cliches exist because we have common understanding of certain spoken images. I believe we can look at clichés as precursors to text-speak - where certain expressions or statements are understood to have a generally understood meaning. In that way, I can see them as precursors to text-speak. My neighbor is all thumbs - now, with ten opposable strong digits (doesn't have to be ten, by the way}, what can he do with those strong opposable digits at the end of his hand? One possible, he can open a six pack (not abs) simultaneously. By imagining a use outside the pale, I've come up with an alternate image. Is this funny, maybe. It started with a cliché taken out of context. Cramp Entry. Cliches rub shoulders with each other in this one! #1385239 by Thankful Sonali 12 WDC years! Two hungry people on a desert island. This story is told from a 3rd person point of view. It is a horror story. It is FICTION. Generated in 0.46 seconds at 12:15am on Apr 24, 2019 via server WWW1.